New Orleans would not really be New Orleans were it not for the many architects who designed the city's distinctive building stock over the past two centuries. The Crescent City has benefitted from the work of designers from outside of the city, respected names in the history of American architecture such as Benjamin Henry Latrobe, James H. Dakin, and James Gallier. "Home grown" practitioners, including James Freret, Allison Owen, and Nathaniel Curtis, have also left their at least partially indelible marks. And their tradition is kept alive today by talented designers such as Errol Barron, Michael Toups, and Ken Knevel--all winners earlier this year of the local AIA chapter's Merit Award for outstanding work in the field. This month's Gallery celebrates the contributions of but a handful of these individuals. Additional documentation on their careers, as well as the life work of numerous other architects, is available in the Louisiana Division and in collections around town such as the Southeastern Architectural Archive at Tulane University. Wall of the nave above the iron columns, two bricks thick. 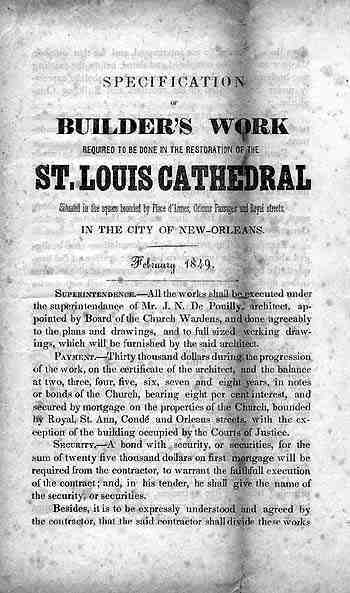 This copy of the specifications was filed as evidence in the suit of the Wardens of the Church of St. Louis of New Orleans vs. J. N. De Pouilly (Third District Court #3566). 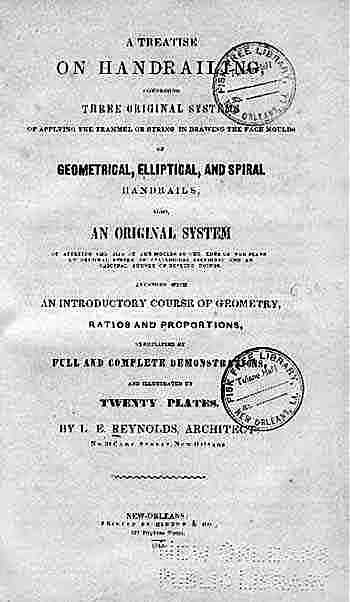 ...having been practically employed at the bench for many years, he has endeavored to adapt this work to the wants of the trade in a simple and familiar style, and to rest the work entirely on its practical utility. Our copy of this work is inscribed to "Col. Jas. H. Dakin, with the respects of the author." 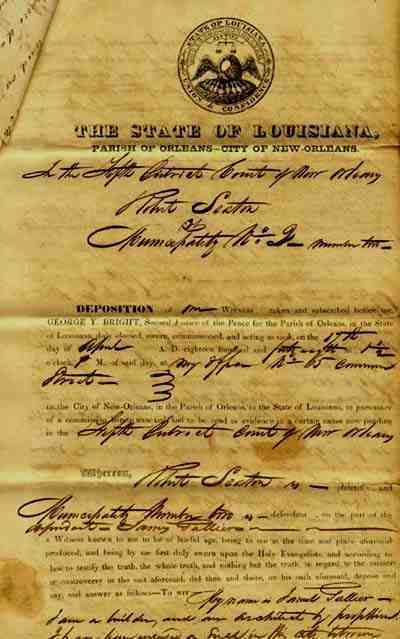 My name is James Gallier. I am a builder, and an architect by profession. I have been engaged as such in this city between fifteen and sixteen years. I have been employed to superintend several very large buildings in the city. The St. Charles Hotel was erected under my superintendence. By the end of the 1880s city government was beginning to become more specialized. 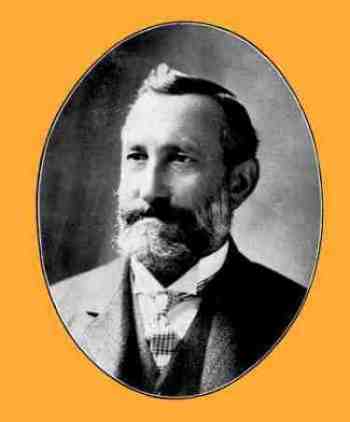 When the state legislature created the Orleans Levee Board in 1890, it provided that the City Surveyor--renamed the City Engineer--would function as chief engineer for the new levee district. Despite the name change, however, the City Engineer's Office continued to perform most of the same functions performed by the Surveyor's Office since its inception. 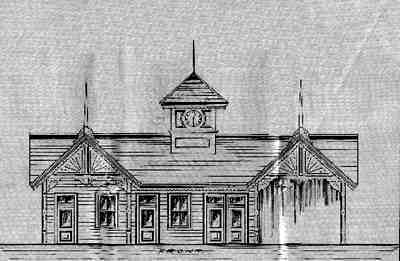 This plan for a new Jackson Avenue Ferry House was approved by L. W. Brown, the City Engineer, in 1896; the design was probably the work of one of his deputies. City Engineer's Office. Miscellaneous plans. Often the line between designer and builder was less than distinct. Julius Koch is one individual who labored actively on both sides of the drafting table during the late nineteenth and early twentieth centuries. 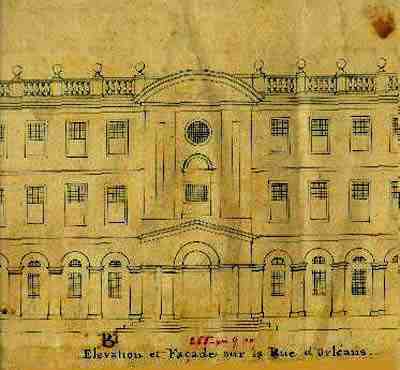 According to records compiled by the Friends of the Cabildo, Koch designed a number of residential structures, including a house for Mrs. George Denegre in the 900 block of St. Charles near Lee Circle. His construction projects include such prominent landmarks as the original Isaac Delgado Museum in City Park, the Frank T. Howard School (now the New Orleans Free School) on Camp and Foucher Streets, the fantastic home built for Dr. Loeber on Coliseum Square, and the now demolished Washington Artillery Hall on St. Charles. Julius Koch also left a lasting contribution to the local architectural profession in the person of his son Richard who, with his partner Samuel Wilson, Jr., pioneered the restoration of local building treasures. George A. Simms (ed.) Notable men of New Orleans, 1905. Sam Stone, Jr. was a native of Tennessee who came to New Orleans where he worked with Thomas Sully. He later formed the firm Sam Stone & Co. with his two sons. Among his larger projects were the Hennen (Maritime) building on Carondelet Street (with Sully), the Maison Blanche building, the Masonic Temple, and the First Presbyterian Church on South Claiborne. Just before his death in 1933 Stone prepared the plans for the reconstruction of the French Market. This portrait dates from the period of his service as the city's Commissioner of Public Safety. 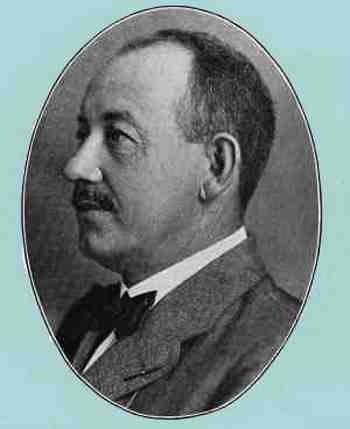 Martin Behrman Administration Biography, 1904-1916. 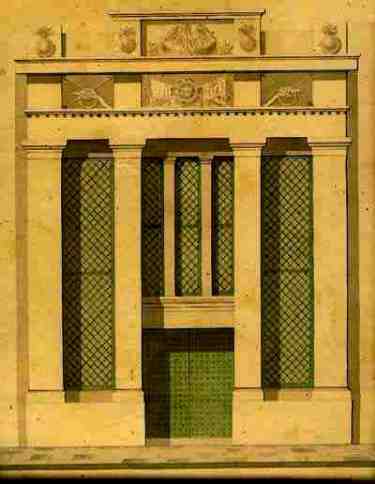 The City Archives holds copies of numerous Stone plans including the original on Canal Street, one of his collaborations with Sully. New Orleans architects have served the city over the years as members of numerous boards and commissions. 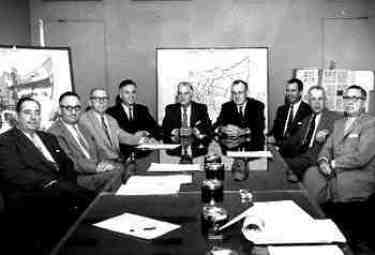 August Perez, Jr. (far left) is pictured in this photograph of the City Planning Commission in 1957. Louisiana Photograph Collection. Municipal Government Collection. Mayor deLesseps S. Morrison--City Planning Commission. 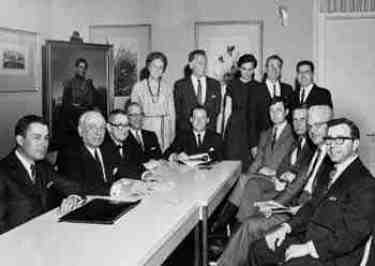 Several architects served on the Vieux Carre Commission in 1967. This photograph shows Richard T. Simoni at far left, Solis Seiferth to his immediate right, and S. Stewart Farnet (seated, fourth from the right), and D. C. LeBreton (seated, second from the right). Louisiana Photograph Collection. Municipal Government Collection. Vieux Carre Commission. In 1960 the Orleans Parish Landmarks Commission dedicated a plaque designating Jackson Square as a local historical landmark. 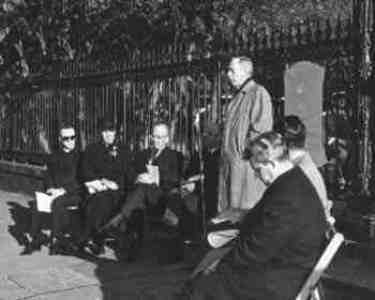 The Commission's historian, architect Samuel Wilson, Jr., is shown in this photograph addressing those present for the event. Louisiana Photograph Collection. Municipal Government Collection. Vieux Carre Commission. 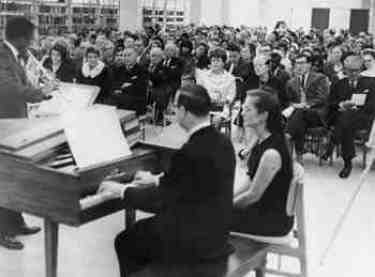 The musical event shown in this photograph was one of several events held in conjunction with the opening of the new Central Library on Loyola Avenue in 1958. Among the guests at the concert is Arthur Q. Davis (first row, second from right) whose firm, Curtis and Davis, designed the award-winning facility. Louisiana Photograph Collection. Municipal Government Collection. New Orleans Public Library..